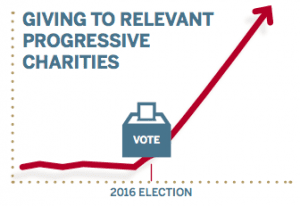 Charitable giving in the weeks following the 2016 election increased significantly for progressive charities with relevance to key election issues. While overall charitable giving was lower immediately following the 2016 election than would be expected in years without a national election, this lower-than-expected charitable giving was concentrated among men; women’s giving to all causes increased compared to men’s giving post-election. The increase in charitable giving to relevant progressive charities after the 2016 election was driven primarily by women donors. In the week before the election, women gave more than men to these types of organizations; this giving accelerated in the week after the election, with the difference between women and men’s giving increasing six-fold. Nonprofits also need to be aware of the political cycle, whether or not they have any sort of political or ideological leaning. […] Progressive organizations, especially those that address issues explicitly raised during the 2016 presidential campaign, received more funding in the wake of the election, perhaps by those concerned about how certain issues would be affected given the election results. In short, all nonprofits should be prepared for fluctuations in their gifts following an election. Ultimately, nonprofits exist in a political environment and need to recognize opportunities to maximize giving due to political events. For example, I am willing to bet that if WPI studied the giving to progressive causes protecting reproductive freedom following the appointment of Judge Kavanaugh to the Supreme Court, they would find a substantial increase in giving from progressive women donors. 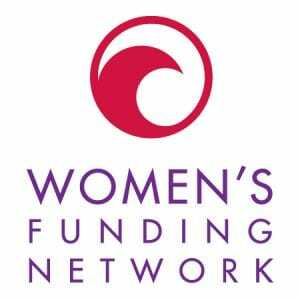 Nonprofits serving progressive causes should be ready to work with women donors to help them leverage more of their assets to protect reproductive freedom now that Kavanaugh is appointed.